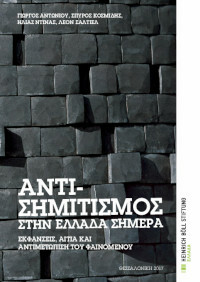 This report presents the results of two opinion surveys conducted in Greece, in June 2014 and January 2015, on the issue of antisemitism in the country. After a brief discussion on the meaning and origins of the phenomenon of antisemitism, the study presents an overview of its manifestations in the Greek society, in particular politics, the Church and the media. A detailed presentation of the findings of the two surveys follows, which measure antisemitic attitudes in the Greek society and correlate them with factors such as gender, age, political opinion, education, church affiliation but also trust, cosmopolitanism, belief in conspiracy theories and victimhood. The results confirm previous studies and assumptions that antisemitism in Greece is very high (around 70%), the highest percentage in Europe. The report ends with recommendations on how the government and the Greek society as a whole should act systematically against this scourge.